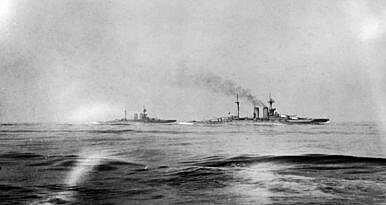 HMS Warspite and Malaya during the battle of Jutland fought in May and June 1916. The Great War has less to tell us about how a Pacific War might start than what it might look like. Last week I wrote about two studies that imagine a future war between the United States and China. The first by prominent scholars and military analysts Stephen Biddle and Ivan Oelrich, and the second by former senior U.S. intelligence official David Gompert written for RAND, both conclude that despite U.S. superpower-status and pursuit of “third offset” and AirSea Battle (ASB) technologies, and China’s rapidly advancing anti-access/area denial (A2/AD) capabilities, the war is likely to be protracted, costly, and inconclusive. Without saying so explicitly, the studies conjure a future war that looks startlingly like an old one—World War I. But contrary to most comparisons between the Pacific now and Europe then, which focus on how a future Pacific war might start, the more useful lessons are in the dynamics of the fighting itself: belief in pre-emption and an offensive “first-mover” advantage; predominant technology that actually favors defense; and the strategically superior position of an offshore power over a continental one. Scholars and analysts used the centenary of the First World War two years ago to compare that European conflagration with the prospect of a Sino-U.S. war. Many focused on how the Great War began and parallels to the Western Pacific today: a rising power vying for influence against a complacent superpower; rampant nationalism limiting the diplomatic options of political leaders; entangling alliances that open the door to third parties dragging great powers into conflict; social, political and economic interdependence inadequate to prevent clash; and the danger of a minor incident escalating out of proportion. Analysts generally found enough differences to reject the inevitability of a Sino-U.S. war, but enough similarities to warn against complacency. …trends in technology will make it possible for China to bring the recent era of U.S. command of the global commons to an end in coming decades if the Chinese pursue the required technologies and use them to their full potential. AirSea Battle will not prevent this. Yet the result need not be a new era of Chinese regional hegemony—with astute choices, the long-term military prognosis in the Western Pacific is neither U.S. nor Chinese dominance but a future of competing spheres of influence in a system where most U.S. allies will find themselves imperfectly, but substantially, secure. The conclusion that U.S. and allied positions will remain comparatively secure despite competing A2/AD spheres recalls the British Navy’s strategically superior position over the German Navy in WWI. Leading up to the war, Imperial Germany assembled a massive High Seas Fleet designed to match Great Britain, the reigning maritime superpower, not unlike China’s A2/AD capabilities designed to blunt U.S. power projection. In 1916, the Battle of Jutland off the Danish coast was the only time the High Seas Fleet broke out of its bases in the Baltic Sea to challenge the British fleet. Until then, Britain had effectively bottled the Germans up with a distant blockade from its bases in Scotland and the east coast of England, just as the U.S. and its allies might blockade the Chinese fleet inside the first island chain stretching from Japan in the north, down through the Philippines. Tactically, the battle appeared to be a German victory; Britain lost twice the number and tonnage of ships as the Germans and twice the number of sailors. However, while the battle was perceived as an intense disappointment in Britain, the strategic situation was unchanged, and therefore a de facto British victory. Germany’s fleet failed to defeat the British thoroughly enough to break out into the wider Atlantic and threaten the commerce Britain depended on for survival, and never again risked battle on that scale with Britain’s Grand Fleet. In the same way, an A2/AD stalemate between the United States and China would still leave the former in the strategically superior position of controlling the first island chain, keeping the Chinese navy and merchant fleet largely contained behind it. …as both sides hone their military strategies with the aim of controlling a war, they reduce the possibility of control. Military officers of both countries have spoken and written about how to achieve operational advantage, or at least avoid disadvantage, by striking the other side’s forces at the outset of a conflict. Given the “first-mover” advantage and the corresponding danger that perception of a climbing probability of hostilities would increase the pressure on each side’s trigger finger, the goal of avoiding a war must compete with that of winning one. This first-mover problem recalls the “cult of the offensive” that contributed to the outbreak of WWI. Offensive operations were perceived to have the advantage over defenses and the massive conscript armies of the day took time to mobilize. Thus, the European powers were incentivized to begin mobilization even on the threat of war, lest a late mobilization leave them vulnerable. The result was that the decision to mobilize was in effect a commitment to war. As I wrote last week, an “informationized local war” fought with Third Offset-ed technologies in the Western Pacific would not be the “sudden, cruel and short” conflict envisioned by strategists, but something more like the costly, drawn-out trench warfare of WWI. In that scenario the respective mainlands are the trenches and the sea between them a maritime no-man’s-land, with localized battles for control in the seas and skies beyond. Unlike the tanks and airplanes that broke the trench stalemates in WWI, it isn’t clear that equivalent disruptive weapons will exist for the U.S. or China to exploit a decisive advantage. Instead these studies recommend that the United States is better off investing in an A2/AD umbrella of its own to defend the first island chain. In the end, the best antidote to a Sino-U.S. war is not understanding the spark that might start it, but a mutual recognition of the elusiveness of victory and the cost war would wreak on both. Recent studies suggest A2/AD and AirSea Battle lead to costly stalemate, not victory.